Putting yourself out there is tough! Especially if you are the kind of person who is content with spending time alone or in the company of a few people. But it’s got to be done if you want to build a business. A few weeks ago, I appeared in Lion’s Den, Kenya’s version of Shark Tank or Dragon’s Den. The show involves entrepreneurs pitching to a group of investors for capital in exchange of equity in their business. From the feedback I’ve been getting, there’s a lot of entrepreneurs struggling with the question of whether or not they should be more vocal or public about what they are doing. They have a fantastic product or service that’s got some traction. They are whip smart. But they find it extremely hard to talk about themselves and the amazing things they are doing. One of my favorite shows is the Amazing Race. In it, a bunch of teams race around the world for a 1 million dollar prize. In between, they take part in a series of competitive tasks that may potentially fast track or slow down the team. In the last episode of the 20th season, the team that won accidentally skipped the last task and got to the finish line, only to be told that they had to go back. The team that eventually came second was part way through the task, but they thought that they were losing and didn’t put in the effort necessary to win. The winning team though came to the last task knowing that it was all or nothing. They had tasted success and were not going to let it go, they completed the task and came out on top, despite starting from behind. Whenever I have doubts in my mind, I always go back to that last task and the sheer will, determination and competitiveness of that team and I get the job done. That helped me to silence the voices that questioned whether I wanted to put myself out there and what I would do if I failed…more so in public. The key is to have a tunnel vision of sorts so that it’s you, your target and the path to it. Everything else is noise. In front of a group of friends, I went over the pitch over and over again until I felt I was at a point where I was comfortable. It took hours, but it was well worth every minute. A great trick that one of them showed me was to focus on a set number of key points that I had to mention no matter what I rambled about or what questions the Lions asked me. In my case, I had to talk about four things: the amount of investment we were looking for and the equity to be exchanged for it, the product and what made it unique, where we are currently and where we plan to be in the future. Those four points reined my mind whenever I panicked, and helped ensure that my message was communicated. Over the years, I’ve noticed just how much we are by-products of the way we were brought up. Our backgrounds shape our thinking in profound ways. For example, a popular Swahili sayings is “chema chajiuza kibaya chajitembeza” (a good thing/person sells itself while a bad one advertises itself). Contrast that with a popular English one that states: “a squeaky wheel gets the grease”. While I don’t mean to say that there are no contrasting sayings in one culture, my upbringing, and that of many Kenyan children, exalts others over self. So using the word “I” is very difficult, and sometimes feels downright selfish. The challenge is that the world operates differently, and you are expected to talk about what you do, over and over and over again. I’ve dealt with this in two ways. Second, I tell myself that I have to be realistic. I have a product that I love and want to share with the world. I better be prepared to talk about it if people are to buy it. We could make the best shoe in the world (I think we do) but if we don’t tell anyone about it, how are they supposed to know to buy it? In the words of Ted Turner “early to bed, early to rise, work like hell and advertise”. In the spirit of letting people know what we do, we made it through Lion’s Den, and despite not getting a deal, the experience propelled us into making the shoes and getting them to the market. 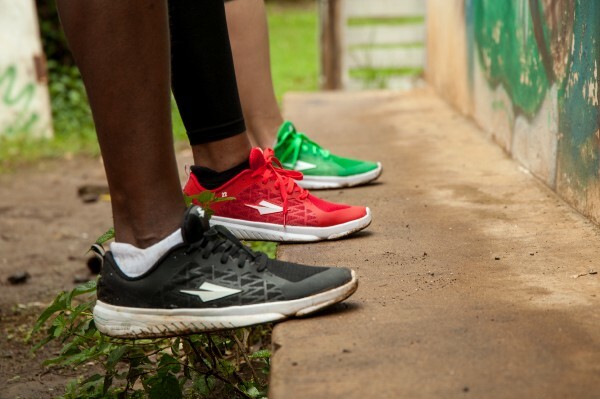 Our mission is to make Enda Itensthe shoes of choice for every runner in the world.